Look at his grin. He knows there is money hidden inside, but it's not readily apparent where it is. Allison, age 2, is licking her lips. She hasn't caught on yet that it's not actually an ice cream sundae. Timothy gently pulled the 'whipped cream' off the top and looked under it. Nothing. Then he gently tore it apart. A quarter! And some more! Each part of the sundae, including the 'chocolate sauce', had coins hidden inside. The straw was the big ticket item, as it had a $20 curled up inside it. So how did I make a money-filled faux sundae? 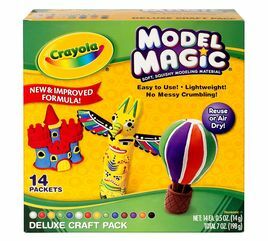 Crayola's Model Magic! If you're not familiar with it, you should rush out and buy some. It's lightweight, air-dry clay that is really easy to mix and shape. I've been a fan for years, though I think this is the first time I've blogged about it. I'll have to show you more of how you can use Model Magic in a future post, because it really is super cool. Anyway, here's how I made the sundae. I began by mixing several packets of white with one packet of green to create a minty color. I pressed it out flat on a paper plate, then put some coins inside and gathered it into a ball. That's when I discovered that working on a paper plate is not ideal. So don't do that. Use waxed paper or a craft mat instead. Continue until you have three scoops of ice cream. Mix some black and brown Model Magic to create a brown that looks like dark chocolate. Use a fingernail to pull tiny, irregular bits of clay, then roll the green scoop over the bits. They'll stick immediately. Take the remaining dark brown clay and flatten it to make freeform globs of hot fudge. There's space to embed a few coins in it. Use plain white Model Magic to form a ball with coins inside, then gently twist it to form the whipped cream. Press it down carefully on the waxed paper to flatten the bottom and give it a realistic look. Set it aside. Next, use red Model Magic to make a cherry. I didn't have any red on hand, so I used some of the brown and painted it red after it dried. I would have preferred not to have the extra dry-time, but not enough to make a special trip to the store when I had red paint and brown clay on hand. Cut a 2" piece of green Twisteezwire and a 1" piece of brown. Twist the brown tightly around one end of the green to make a cherry stem. Poke it into the clay cherry. Roll up paper money and push it into the straw, leaving enough sticking out so that it can easily be removed. Let all the pieces air-dry at least one day. The larger ice cream scoops and the whipped cream will take much longer to dry than the chocolate sauce. Here are all the components of my sundae (including the not-yet-painted cherry). When all the pieces are dry, layer them in a glass sundae jar. The gift is ready! I bet working on a silpat would work too. So creative. I love it!